Download Bandicam 3.3.3.1209 latest version from direct download link. It is a screen capture utility that can take screenshots or record screen changes. It consists of two modes. One is the ‘Rectangle on a screen’ mode, which can be used for recording a certain area on the PC screen. The other is the ‘DirectX/OpenGL window’ mode, which can record the target created in DirectX or OpenGL. 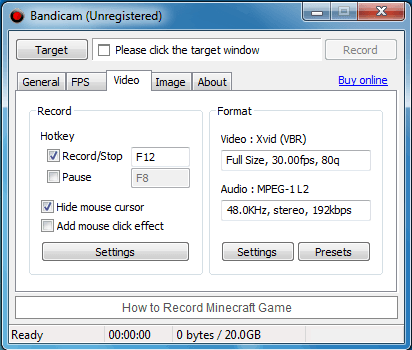 Bandicam is best for recording your video game play. This program displays a FPS count in the corner of the screen while it is active in the ‘DirectX/OpenGL window’ mode. When the FPS count is shown in green, it means the program is ready to record, and when it starts recording, it changes the color of the FPS count to red. The FPS count is not displayed when the program is recording in the ‘Rectangle on a screen’ mode. Bandicam is a shareware, meaning that it can be tested free of charge for a limited period of time. During trial period, it places its name as a watermark at the top of every recorded video or screenshot, and each recorded video is limited to 10 minutes in length. It can record video at resolutions up to 2560×1600 in size. As it supports AVI 2.0 OpenDML extensions, the maximum clip size is unlimited as long as the local Hard Disk has free space available. The program works with games or programs that use DirectX or OpenGL graphics that includes the vast majority of PC games such as Skyrim, Minecraft and WOW etc. The good thing is that Bandicam can record high-quality videos, but to compress the file size is relatively small for the HQ video when you want to upload to YouTube.